Kids' desert shoes from Clarks Originals. Crafted from premium suede sourced from the Charles F. Stead tannery, the 'Desert Trek' shoes are a mini version of the original, and feature a rounded toe, central butted seam detail and derby lace-up system with two eyelets. Finished with 'Trek Man' emblem to the heel counter. Set upon a rubber sole with crepe-like appearance. Upper/Lining: Leather. Sole: Rubber. Sparkling silver-tone low top trainers from Converse. The ‘Chuck Taylor All Star’ trainers have a party dress-inspired, glitter upper with satin ribbon laces, oversized metal eyelets and a logo patch on the tongue. The sneakers sit on a white rubber sole with a textured outsole for added traction. A logo licence plate on the heel, a contrasting midsole stripe and a rubber toe cap complete the design.Upper: Synthetic. Lining: Textile. Sole: Rubber. Sparkling gold-tone low top trainers from Converse. The ‘Chuck Taylor All Star’ trainers have a party dress-inspired, glitter upper with satin ribbon laces, oversized metal eyelets and a logo patch on the tongue. The sneakers sit on a white rubber sole with a textured outsole for added traction. A logo licence plate on the heel, a contrasting midsole stripe and a rubber toe cap complete the design.Upper: Synthetic. Lining: Textile. Sole: Rubber. 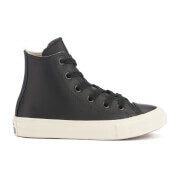 Kids' ‘Chuck Taylor All Star’ trainers from Converse. Crafted from durable canvas, the hi-top sneakers comprise a rounded toe with a rubber toe cap and a lace up fastening with metallic eyelets and flat, white laces. Placed upon a contrasting rubber sole with a signature striped midsole, the high tops are complete with All Star branding to the ankle and a pink license plate at the heel. Upper: Canvas. Sole: Rubber. Kids’ Converse Chuck Taylor All Star II Hi-Top Trainers with a navy leather upper. Set on a white rubber midsole, the classic trainers feature the iconic All Star logo and breathable metal eyelets on the inside of the shoe. Complete with a textured rubber outsole for traction, a toe cap and All Star logo detail on the heel. Upper: Leather. Sole: Rubber.